A charming Swedish stripped pine extending table. 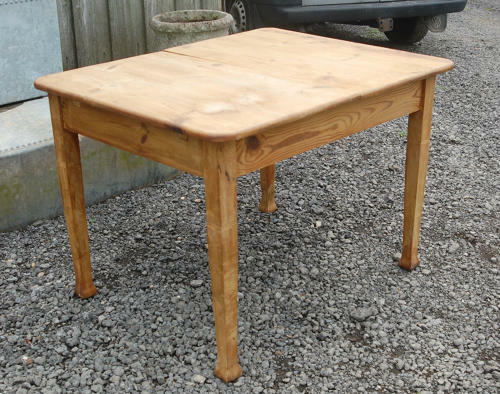 The table has a fantastic rustic look and simple carved line detailing around the top of the legs and pad foot design. The table has a fully working and well designed extending mechanism that allows for a removeable pine leaf that enlarges the table by 29cm. The table has been stripped and has a lovely pale colouration and natural grain. The table is a reclaimed antique and therefore has some signs of use and wear, adding to the tables rustic charm. The table has signs of treated woodworm, with worm holes visible. There are some character cracks, scratches and marks to the wood. One leg has been replaced and there is a neat repair join. When the table is not extended there is a slight drop to one side where the two sides meet. Please see photos for full condition details. The table is a fantastic item with much charm and character. The tables rustic appearance makes it perfect for many vintage or shabby chic interiors and the extended panel is an extremely useful feature.